The garden pea is one of the most popular and earliest vegetables with numerous varieties now on the market. A member of the Leguminosae family, peas are thought to be natives of Europe and western Asia. There have long been considered two main types - smooth seeded and wrinkle seeded. The smooth seeded peas are a bit more cold hardy and so are often sown first, but are usually smaller than the seeds of the wrinkled varieties and tend to 'go starchy' faster as they mature. They are the preferred type for use as dried peas for soups. The wrinkled varieties are sweeter and have long been preferred for eating fresh, canned or frozen. 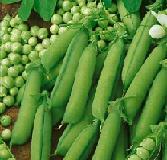 Because peas are intolerant of hot weather, it is best to plant them in spring as soon as killing frosts have passed. Light frosts will not harm seeds in the ground or small plants above ground. In warmer climates such as the southern US, they may be sown in fall as well. 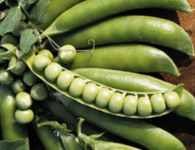 Peas grow best in a light fertile soil that does not dry out excessively. The best preparation for a pea plot should be begun in the fall or early spring. The soil should be worked to a depth of about 10-12 inches with a generous amount of compost or well rotted manure worked in, then allowed to sit through the winter. In the spring as soon as the soil can be worked, the area should be tilled until fine. If the soil is rather sandy, it is best to work in a considerable amount of compost or manure to a 12 inch depth. Once the seedlings are about 6 inches tall, the plants should be mulched with decayed manure, leaves or other organic material. Peas should be staked or provided some support on which to climb. They do not tend to do as well when left to run on the ground. Teepees, fencing or other support may be used. When small, the plants should be kept weed free and not allowed to become excessively dry, which will hamper their production. Mulching the plants will cut down on both weed growth and water loss. Peas should be harvested when the seeds are full, but not tough. 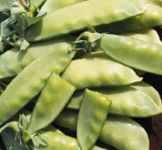 Edible pod peas should be harvested young, when the pods are still tender. California Black-eye (75 days) A southern US favorite, these little round peas are more like beans and need warm temperatures to develop fully. This variety has the characteristic black eye and produced 6-7 inch pods, filled with seeds. Delicous cooked. There is great diversity in the pea varieties that we offer; which makes the general information provided only valuable as adjustable guidelines. This may also affect your seed planting and propagation strategies and the germination rates under your planting conditions may vary from the seed lot test results. The following soil temperature data is for peas in general. Temperatures are average daytime from planting to emergence. Percentage is average germination rate. Days is number of days to emergence.